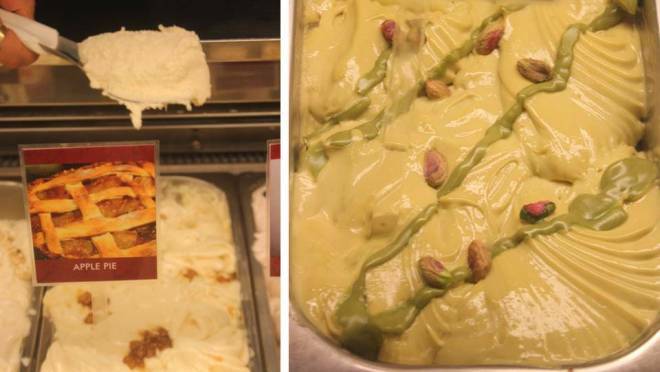 We often wonder, “can one find a good gelato outside of Italy?” Our search for a “yes” continues in Dubai, one of the few cities outside of Italy who offers a course held by Carpigiani’s University of Gelato in Bologna. 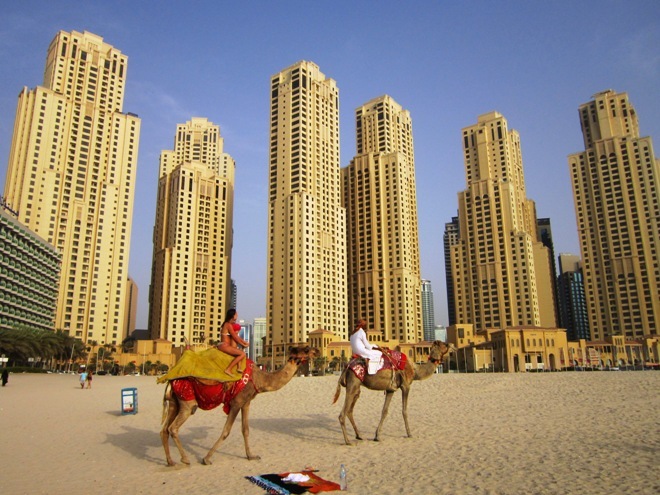 Our first encounter – after spotting a couple of camels walking nonchalantly on the beach – is on the corner of the busy, touristy walkway of JBR. On a corner, a sign reading “Cone Street. Gelato Italiano” boasts authenticity. Will the ice cream live up to its claim? The ‘Amerena‘, a cherry flavor, is overly sour and not creamy enough. Packaged chunks of chocolate atop provide little aid. The Yogurt is boring. The “Italian Amaretto” tastes like… nothing. They say the place is managed daily by Italians and they only use Italian ingredients. We would never have known. We savor every bite slowly, attentively, determined to give it a second chance. Unfortunately, it doesn’t improve and we abandon our Cone Street on the street. The next afternoon we are taunted by a stand inside the infamous Dubai Mall. “Morelli’s Gelato” brags about a century of history. It began when an Italian immigrant moved to UK and started selling ice cream on his bicycle. 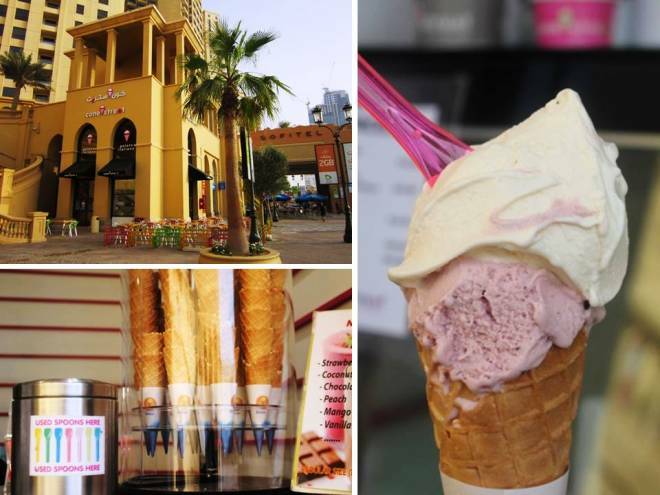 Since then, Morellis has opened ice cream parlous in London, Monaco, Dallas, Abu Dhabi, Kuwait, Dammam and Dubai. Despite a well presented, flashy display, we are hesitant to try. We’ve made this mistake before so this time we inquire about production. “How is the gelato made?” The lady informs us that they have a designated gelato maker, a Filipino who has been trained by a specialist from Italy, begins preparing it at midnight in order to be ready by 8:00 a.m. The staff is kind, knowledgable and friendly. Their gelato captures our interest. The Apple Pie flavor looks enticing. Their Pistachio is covered in an expensive creme only bought in specialty stores. An assortment of sorbettos is appealing. We sample them all. The Apple Pie lacks spice, substance, those chunks of cake that would give it some excitement. The pistachio isn’t thick enough and its taste is far away from the intensity of the real nut. The sorbets aren’t juicy, richly loaded with fruit as they should be. Are they still satisfactory? Sure. Our biggest disappointment? We gave ourselfves false hope. 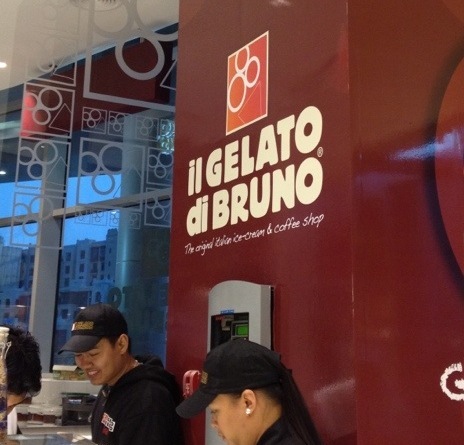 At “Il Gelato di Bruno“, another shop on the bottom floor, the employee claims that “the ingredients, all of them, are imported weekly from Italy, and they have a native Italian who commutes regularly to oversee operations.” One would expect the gelato to be near perfect. It wasn’t. 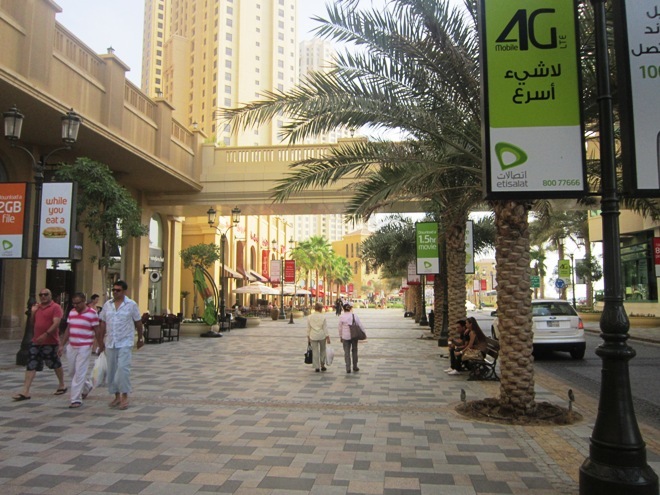 In rudimentary math, we are taught that ‘a whole equals the sum of its parts.’ Dubai, like many others, has all the parts: a high quality product, fresh ingredients, a hand made gelato, even an Italian guru. Still, it is not enough. 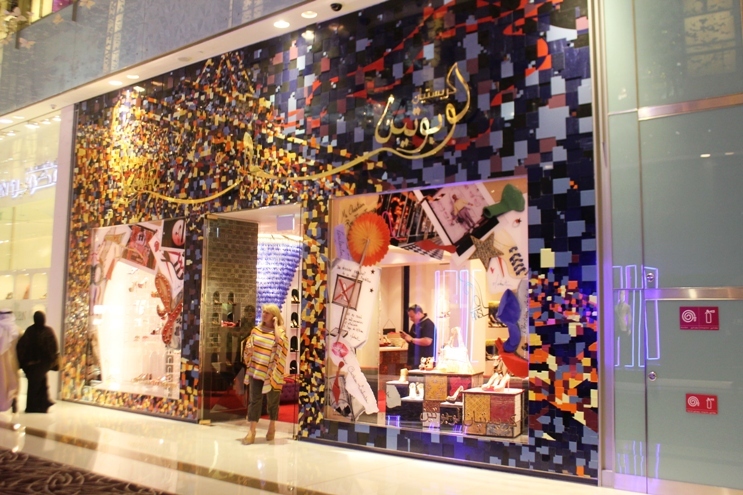 The artisan’s touch could not be duplicated. My experience in Dubai reminded me of something I was told at the recent 2012 Gelato Festival in Florence. The answer, it seemed, should have been obvious. At the question: “What is gelato?”, Achille Sassoli, the Event Director of Carpigiani Gelato University, answered “Italiano“. I’ve lived in Dubai for 2 years now and I’m still struggling with gelato. Nothing tastes decent to me. No real Italian company nor authentic, organic, Italian ingredients whatsoever. Gabriele Poli was right – why go looking for gelato outside of Italy? Go local instead. Arab ice cream (called booza and made with mastic) is fantastic. That’s what you should be sampling in the Middle East. Mt partner Albino and I have been making the best authentic gelato outside of Italy. We are still one of LOndon’s best kept secrets!!! So you probably will not have heard of us!